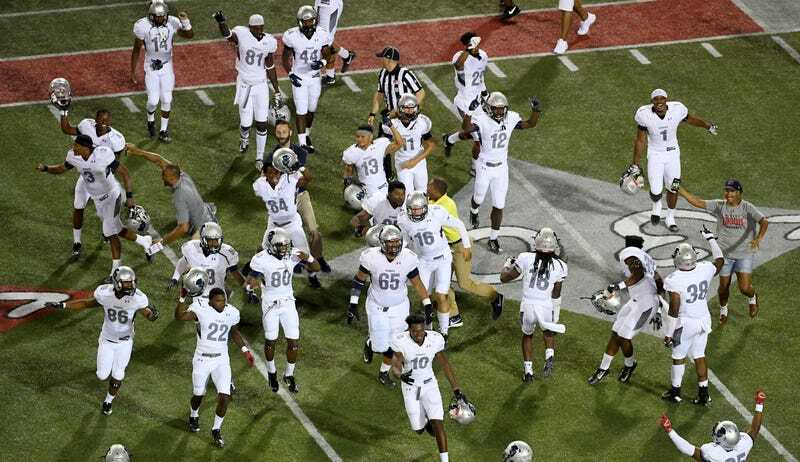 When Howard University’s football team kicked off against UNLV in Las Vegas last night, they did so as 45-point road underdogs. When the game ended, with Howard on top 43-40 after a brilliant performance from true freshman quarterback Caylin Newton, the Bison had pulled the biggest upset by point spread in college football history. Newton, the younger brother of Cam Newton, piled up 330 yards of total offense and three touchdowns. Caylin doesn’t have Cam’s hulking frame—Caylin stands just 5-foot-11 to Cam’s 6-foot-5—but he obviously has more than enough of that dual-threat athleticism, rushing for 190 yards and two touchdowns on 21 carries. Howard jumped out to a first half lead—not all that uncommon for massive underdogs in early season games—but fell behind in the third quarter, and needed a fourth-quarter comeback in order to secure the unlikely win. Howard’s win comes a day after the 10-year anniversary of Appalachian State’s upset of Michigan in Ann Arbor. No point spread was archived on the game between the Wolverines and the Mountaineers, who at the time played in Division I-AA. This was a talking point back in 2007, after the upset—here’s Yahoo’s recap mentioning that the game was considered too lopsided for Vegas to even bother offering a betting line—but you have to imagine whatever the spread would’ve been, it would’ve been hilarious, and almost certainly higher than the Howard-UNLV game. Still, what the Bison pulled off is tremendous. According to SportsInsights, mismatches of this scale often don’t include moneylines, but even without moneylines you have to go back to that same 2007 season, when the 39-point underdog Stanford Cardinal toppled USC, to find an upset with a spread close to this size. For Howard to pull off a 45-point upset, on the road, with a true freshman at quarterback, is incredible. For a final touch of embarrassment for UNLV, the Rebels paid Howard University $600,000 to come play in Las Vegas. Ouch.